Many areas of the universe where stars form are also known to contain complex organic molecules. These molecules contain six or more atoms, with at least one of these being a carbon atom. A group of these complex organic molecules are known as prebiotics, the structures of which are closely linked to molecules essential for life, including amino acids and sugars. One of these prebiotics is methyl isocyanate. These chemical structure of this particular prebiotic is particularly interesting due to its similarity to peptide bonds, which hold the amino acids in proteins together. These prebiotic molecules are recognized as a potential early building block of life and therefore their discovery in our universe is important as it may give scientists new information to help us understand the origin of life. It was thought that methyl isocyanate has been detected by the European Space Agency’s Rosetta mission, on the comet known as 67P/Churyumov-Gerasimenko. Although the finding is contested by some scientists, if confirmed it would be significant, due to the fact that comets are believed to have existed in a relatively unchanged state since the formation of our solar system. 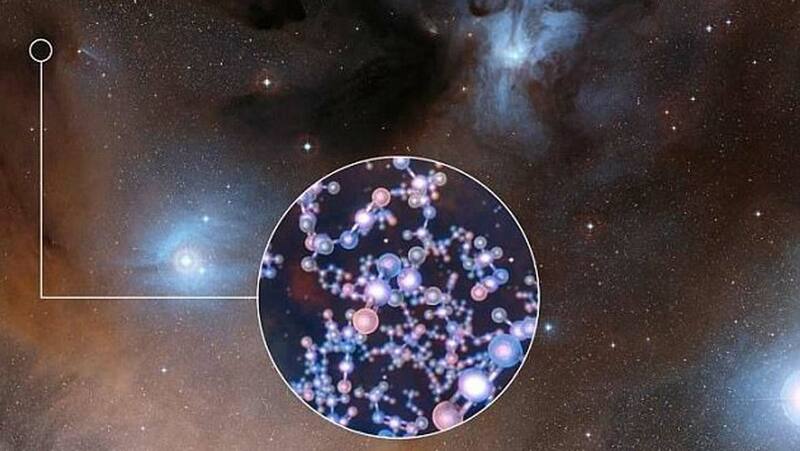 It has also been detected in two dust clouds known to be forming stars, Orion KL and Sagittarius B2(N). These clouds contain high-mass protostars with an incredibly high temperature. The question that two teams of international scientists wanted to answer was whether or not methyl isocyanate is also present in areas surrounding protostars with a lower mass, therefore resembling our own sun more similarly. The detection of specific chemical compounds in specific stars is made possible through the study of the frequencies of light emitted by different molecules. The presence of different molecules, including methyl isocyanate will be observable as spikes or lines in the spectrum of light emitted by these stars. One team, including Niels Ligertink from the Leiden Observatory in the Netherlands first focused on a cluster of young stars, called IRAS 16293-2422. Using data collected by ALMA in 2014 and 2015 they discovered 43 lines, or ‘unblended transitions’, indicating the presence of methyl isocyanate. Another team led by Rafael Martín-Doménech based at the Center for Astrobiology in Madrid also found an additional eight lines, in a different range of frequencies. To collect this data, the teams used the Atacama Millimeter/submillimeter Array (ALMA), located in Chile. Both papers, titled respectively ‘The ALMA-PILS survey: Detection of CH3NCO toward the low-mass protostar IRAS 16293-2422 and laboratory constraints on its formation’ and ‘Detection of methyl isocyanate (CH3NCO) in a solar-type protostar’ have just been published in the journal Monthly Notices of the Royal Astronomical Society.